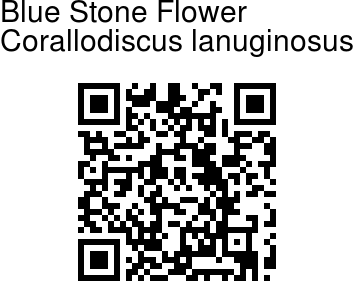 Blue Stone Flower is a perennial herb found growing on rocks. Leaves are many, in a compact basal rosette, hairless to densely woolly, blade broadly lanceshaped, obovate, rhombic, elliptical, or round, base broadly or narrowly wedge-shaped, veins prominent. Flowers are borne in cymes in leaf axils, one- to many-flowered, lax, bracteoles apparently absent. Sepals are free nearly to base or fused halfway. 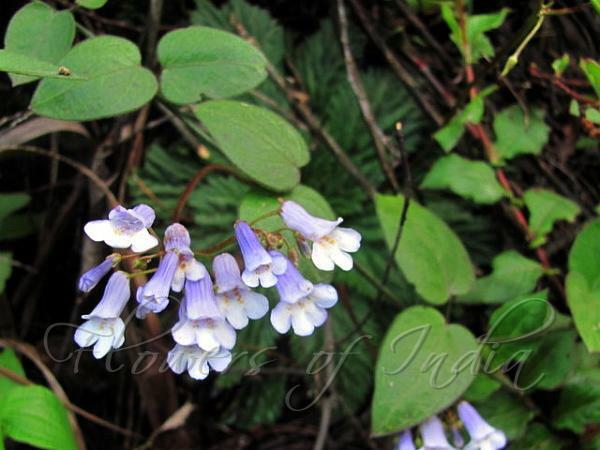 Flowers are tubular, blue to purple, with 2-lipped limb. Upper lip is 2-lobed, shorter than 3-lobed lower lip, lobes nearly equal, rounded or obtuse. Lower lip has dense beard inside of tube. Color can be rarely yellow or white. Stamens are 4, inserted above flower base (rarely above middle), included or slightly protruding, anthers dorsifixed, coherent in pairs. Nectary is ring-like. Ovary oblong, with 2 parietal placentae; stigma capitate. Capsule is usually oblong to linear, much longer than calyx, splitting open. 700-4300 m. Blue Stone Flower is found in China, Bhutan, N. India, Nepal, Sikkim and Thailand, ataltitudes of 1000-2400 m. Flowering: April-October. Medicinal uses: In Tibetan medicine, it is believed to cure poisoning, diarrhoea caused by hot diseases and disorders of kidney. Leaves are the part which is used.